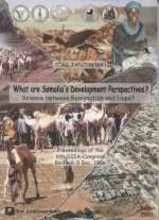 What are Somalia's Deve­lop­ment Perspec­tives? Science between Resi­g­na­tion and Hope? Procee­dings of the 6th SSIA-Congress: With contri­bu­tions by Franz Ansp­renger, Mohamed Haji Mukhtar, Faduma Awow Mohamed, Ulrich Scholz, Jörg Janzen a.o.